Dressing up is so much simpler during the summer months when you can slip on a cotton dress and a pair of sandals or simply a pair of jeans and t-shirt and be ready to head out the door in a matter of minutes. Getting ready for parties and formal events too require minimal effort. In the winter months though you might feel like dressing up nice and good is pointless since you end up pulling on a bulky coat or jacket on top of everything you wear anyways. 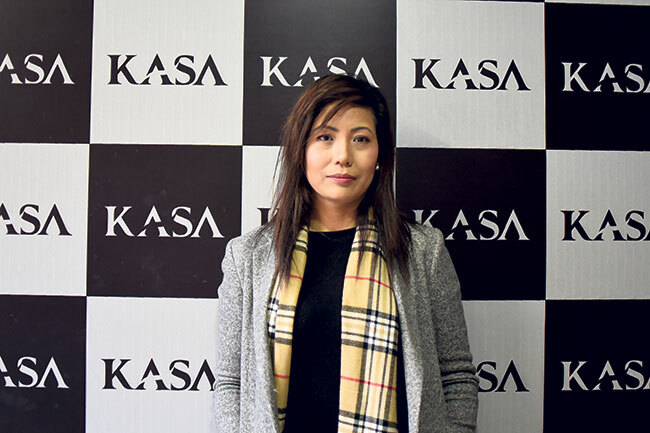 But Ramila Nemkul, founder of Kasa, says you needn’t give style a toss during the colder season. And here she tells us how you can brave the cold while looking your stylish best. For Nemkul, how she feels depends a lot on what she’s wearing. Her clothes give her confidence, she says. As a child, she dressed up her dolls and imagined herself dressing people when she grew up. From a very young age, even before she had basic stitching skills, she fashioned outfits for her friends and family, always giving them advice on how to wear certain clothes or style a scarf. Her foray into the fashion world started around 15 years ago at Kavya Boutique where she designed ethnic wears. It was here that she learnt the know-hows of fashion trends and saw how people were so willing to jump on the bandwagon of a trend. It was also here that she got a measure of what people really wanted from their clothes. “It isn’t always about what the clothes look like. Yes, that is a very important aspect but people also seek comfort. They wish for an extra edge, something that differentiates their outfit from those of others,” she explains. To learn more about designing and the workings of fashion, she went to Italy, one of the major fashion capitals in the world. She later went on to earn her masters degree in fashion designing from India. With this exposure, her works began leaning towards western fashion that, she claims, not only look chic but was also highly comfortable to boot. “When I came back to Nepal, I wanted to apply what I had learnt so that the Nepali market would get its share of classy yet comfortable clothes,” says Nemkul. In Italian “casa” means dwelling (houses in particular). Your dwelling is the universal constant for comfort and being at ease. Through her pieces, Nemkul aspired to emulate and contain the essence of what it feels to be at ease and thus in one’s own element. It is so that upon returning she launched her venture and named it Kasa by replacing the first letter of the word “casa” with the letter, ‘k’ which Nemkul considers her lucky alphabet (and which is also a nod to her roots at Kavya Boutique). Kasa recently celebrated its first year anniversary but it already has a strong presence in the formal wear circle for a recently launched brand. For this season of Miss Nepal, contestants donned designs from Kasa’s ever expanding collection and Nepali celebrities are regularly seen flaunting outfits from Kasa as well. At Kasa, the idea is to create best quality office and formal wears. “Well dressed confident women conquer the world after all,” says Nemkul. She also elaborates on the need to understand the current trends and include them in her collections. “This summer, muted colors were all the rage while in winter people seem to favor vibrant colors. This is exactly the opposite of what happens every year. We have to keep up and accommodate this change of preferences,” she explains. And so, even with 15 staff, Kasa has its hands full. Within the workforce are three designers who, along with Nemkul, discuss ideas in detail before incorporating them into their clothes. The greatest priority for them is to fashion good outfits that alone can boost confidence. Once the designs are finalized, the work passes on to the production unit. At Kasa, they have a team of skilled seamstresses, some of whom hail from India and are highly trained in fashioning clothes. “I realize what it is like when your staff is overworked. A single individual performing all the tasks is no good. 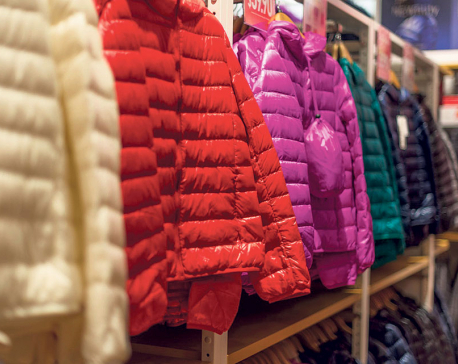 If you want good work, each of your staff has to focus on only one aspect of the work,” says Nemkul adding that, at Kasa, functional tasks are divided so that there is a trio of workers whose sole work centers around making coats. They also employ workers for customer service, which they believe plays as much a role in earning the buyer’s confidence as the clothes. They have a staff solely for running and updating their status on Instagram. It is here that they interact with their customers and share tips on styling and making the best of their clothes. Kasa also uses locally produced fabric from Bhaktapur and Lubhu to make its outfits. Some fabrics are even hand loomed. “Our clothes are inspired by western design but we manage to sneak in some Nepali elements too. And this I believe can aid in differentiating our products in the world market when we decide to branch out,” claims Nemkul adding that she has some pretty grand plans for Kasa. Next year, their clothes are set to be on display at the Milan Fashion Week in Italy. “I have always envisioned for Kasa to go global. We have been working really hard to create a solid identity so far and, with the clothes we make, we are confident that we can carve our way into the international fashion industry,” she explains. Currently, they have one outlet in Patan Dhoka, Lalitpur, but they are soon to launch outlets in Thamel (Chhaya Center) and Boudha as well. The one in Boudha will be launched as early as January 2019. Nemkul says the past year has been a trial period of sorts and that she is still testing the waters with her designs. And she claims that she is now all set to make her clothes the harbinger of confidence and comfort for women around the world. Here’s a season favorite. This long coat has small patches of brown checks that hide away in the dense material but stand out in the right lighting. This coat lends you a classy look as it defines your waistline and makes you look taller especially when paired with a pair of black high heels. The fabric is thick and, assuredly, warm. According to Nemkul, this camel colored coat with large checks is the season’s most happening attire. The dual button long coat can be paired with either formal or casual pants. 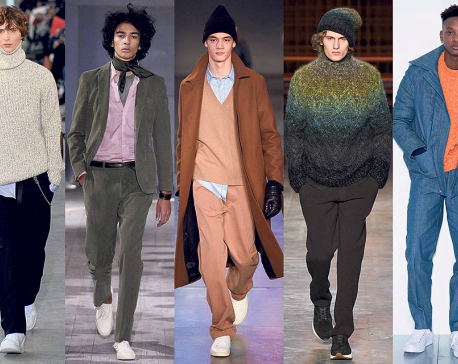 For darker coats, a lighter shade of pants works fine. Dark tan fur neck boots are just the right footwear you need to complete this outfit. This ensemble is how you face the winds of winter with style. Vibrant eye catching horizontal stripes on this coat give a rainbow effect when paired with an all black attire. A small touch of colorful stripes on the coat’s cuff attracts the eye when in motion. The fabric is velvet and thus it is warm enough for the winter weather. Match this outfit with a pair of high heels that have just a hint of color. Formal wear in grey, especially in winter, is a sign of elegance and confidence. For this attire, put together a formal coat with flared sleeves, bell styled pants, and a high-necked white shirt. This isn’t only just a shield against the harsh elements of winter but also a statement maker. Complement this outfit with a pair of high heels, preferably pointed.